It's time to use the handy Random.org to pick the latest round of Brimful Curiosities winners. All winners have been contacted by email. If you are a winner you have 72 hours to get back to me before another winner is chosen. (Click on the image to enlarge the Random.org numbers.) Thanks to all that entered the contests! 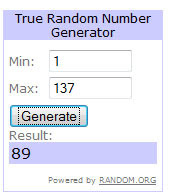 The winner is Karen (comment #89). 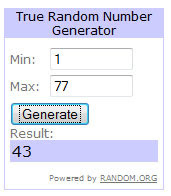 The winner is k_sunshine1977 (comment #43). Guardians of Ga’hoole: The Capture / Wolves of the Beyond: Lone Wolf. The winner is Pam S (comment #8). Worst Case Scenario Survival Handbook: Gross Junior Edition. The winner is susan (comment #65). While supplies last, kids can request a free beaker of Worst Case Scenario Gross Slime! Visit http://www.chroniclebooks.com/worstcasejunior/offer.html.